Marvel’s Agents of S.H.I.E.L.D. 's latest episode, “Watchdogs,” served as a nice change of pace with a new location, some new characters, and fresh challenges. It was definitely needed after last episode’s emotional goodbye to Hunter and Bobbi. The episode started off with Mack arriving at his childhood home in Illinois to visit his brother, Ruben Mckenzie (Gaius Charles aka Smash from Friday Night Lights). It turned out Ruben had no idea what his big brother had been doing all these years. Mack made Ruben believe that he had been working for an insurance company this whole time. Mack even talked about S.H.I.E.L.D. like it was an office job saying things like "there’s new management" and "some of my favorite coworkers were recently transferred." It was interesting how he could spin everything so he wasn’t exactly lying. If we’re being technical Mack DOES insure that people stay safe. Just when Mack thought he was getting a nice vacation of beers, bikes, and food, a terrorist group destroyed a building near Mack’s hometown. This was definitely a little odd. Why would they just happen to choose the ATCU building near Mack’s family home? Of course Coulson sent Mack in to investigate, along with Daisy and Fitz. So much for a relaxing vacation. [caption id="attachment_81642" align="aligncenter" width="600"] MARVEL'S AGENTS OF S.H.I.E.L.D. - “Watchdogs”[/caption] The terrorist group, called the Watchdogs, had taken it upon themselves to start hunting down Inhumans. They were previously just an online group talking but not acting on anything. Now, all of a sudden, they started blowing up buildings. Coulson quickly discovered that his old coworker, aka Agent Felix Blake, had something to do with it. So they set out to find him. Coulson and Lincoln searched his safe house in Atlanta, while Daisy took a more hands-on approach by hijacking one of the Watchdog's vehicles. She discovered where the Watchdog base was and the three S.H.I.E.L.D. agents headed there. But, of course, Mack’s brother decided to follow them, which immediately blew their cover. He also realized that his brother’s job wasn’t exactly what he thought it was. After ruining the mission, Ruben just drove away, confused. Mack went after him and told Daisy to shut everything down, but of course she didn’t listen. Instead she went in to find Blake, which, in turn, led to Fitz getting shot. If anything serious had happened to Fitz because of Daisy’s rash behavior, I would have lost it. Fitz was shot with a chemical concoction that would cause him to implode if they didn't find a way to stop it. Eventually they figured out that liquid hydrogen would do that trick with the help of one of the Watchdog members. The Watchdog member laughed when he realized that Daisy was Inhuman, because the rest of his crew had followed Mack home instead. Grrrreat. [caption id="attachment_81640" align="aligncenter" width="600"] MARVEL'S AGENTS OF S.H.I.E.L.D. - “Watchdogs”[/caption] In the meantime, Coulson and Lincoln were on their own mission trying to find Blake, but all they found was his hologram. Coulson also revealed that he doesn't quite trust Lincoln yet. Coulson said he wasn't sure if Lincoln's heart was in it for the cause or just for Daisy. Lincoln just doesn’t care about anything besides Daisy, which makes it hard for me to care about him as a character. Back at the Mackenzie house, Mack was trying to explain S.H.I.E.L.D. and his real job to his brother, when the Watchdogs arrived. They went on their own mini-mission, gunning down all the Watchdogs. I really enjoyed this scene. It was like a scary movie when people are trapped in a house and have to find their way out without getting killed by hiding assassins. Yeah, that’s a thing. I actually wish it would have been scarier, but I still enjoyed it. Especially because it gave Ruben the opportunity to see what his brother was really like. Plus, we got the invention of the shotgun ax, which was pretty unnecessary, but great. In the end, they escaped, but Mack suffered a gunshot wound. Daisy also talked to Rueben, which was a pretty funny scene. I ship them already. I also really hope we see more of Ruben. [caption id="attachment_81639" align="aligncenter" width="600"] MARVEL'S AGENTS OF S.H.I.E.L.D. 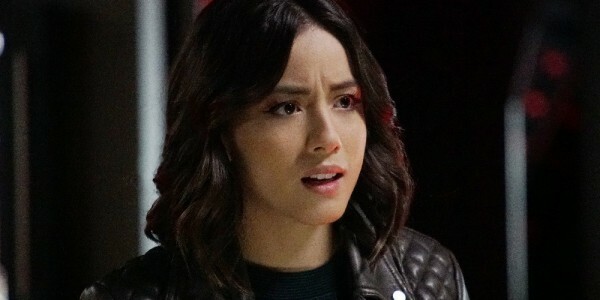 - “Watchdogs”[/caption] During the episode there was also a weird side mission with Simmons and May, where suddenly Simmons wanted to learn how to use a gun and she blamed herself for Lash and all the Inhumans getting hurt, along with Will’s death. All of this happened so long ago that it was strange to me that she was suddenly affected by it. I just hope this situation doesn’t end with Simmons accidentally shooting someone. At the very end of the episode it was also revealed that the whole Watchdogs thing was a distraction from what Malick is really up to. Somehow Malick is behind everything bad that happened this season. Overall, it was a really strong episode thanks to Mack and his brother. They really provided a nice emotional and exciting storyline. I hope we see more of mini-Mack. Next week, it looks the team finds out that Ward is still sort of around. What is Lincoln even doing here?